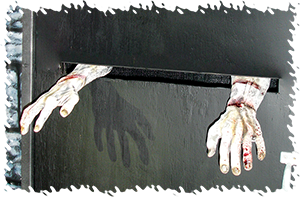 These individual scares are designed to work with the standard plywood wall system that most haunts already use. Only a small rectangular hole cut is required. Since each unit has a very shallow depth, they fit almost anywhere! Each scare is unique and unexpected. 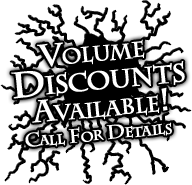 Optional motion activation is available on all products and multiplies the effect. 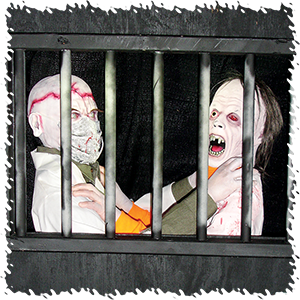 We've chosen an insane asylum theme for presentation, but as is true of all of our creations, all masks, costumes and deco are changeable and customizable to any haunt theme. There are 2 kinds of characters in the asylum: Set-ups and Scares. 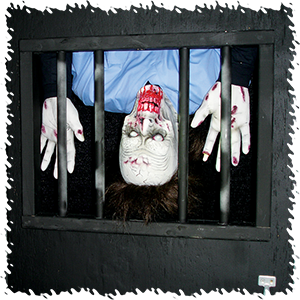 Set-ups run continuously and are designed to distract and sometimes even move guests, in order to set them up for a scare. 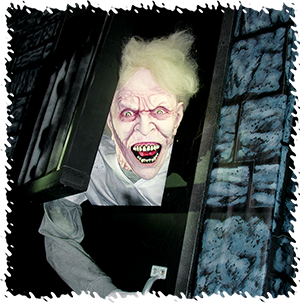 Scares are designed to startle guests in unexpected ways and are generally used with motion triggers. Watch guests jump backwards when the seemingly safe bars on this window are thrashed aside and this terrifying inmate lunges out! This is an epic scare! This unusual therapy might not be covered by your insurance. The brutal, lifelike action of this fight between doctor and patient will make guests run to avoid being the next victim. This is a Set-up designed to distract guests. 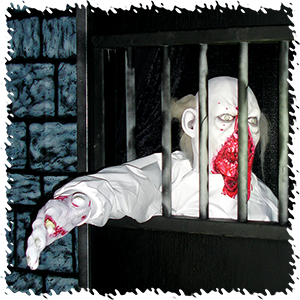 He seems safely chained in his cell, but the speed with which he surges forward into the door will teach guests not to let their guard down. This is a Scare with built-in set-up. This inmate has pried a bar loose and is jabbing it at passersby. Watch out! 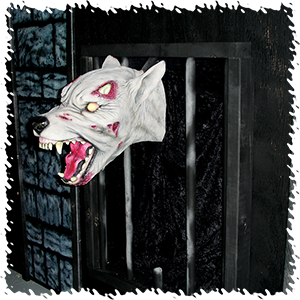 This is a Set-up designed to move guests close to the opposite wall where you can scare them. As your guests stare at the next window, waiting for a startle, surprise them from above! 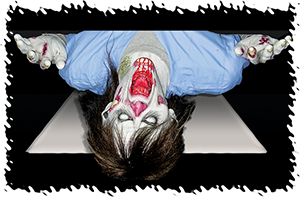 This patient trying to escape through the ceiling, instead ends up scaring the pants off of your guests. This terrifying scare comes down from the ceiling. Distract your guests with a low set-up for best results. 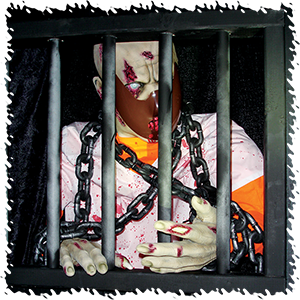 The violent, realistic thrashing of this inmate is a good way to introduce your guests to the kind of psychos that are locked up in this place. This Set-Up is perfect for the beginning of your asylum. 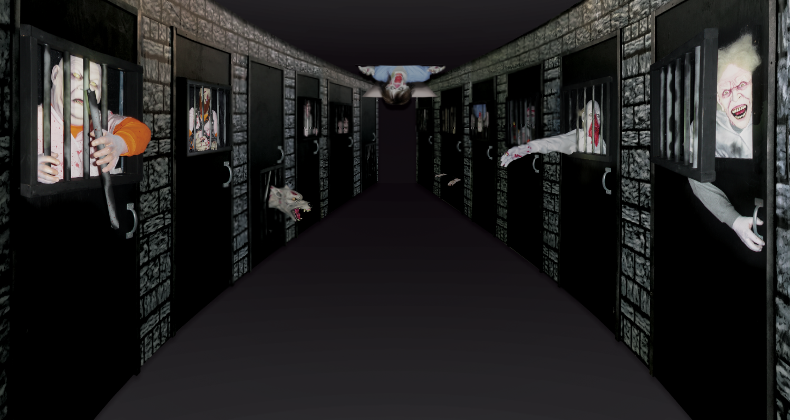 It gives back story and establishes the misguided assumption that the inmates are safely contained. Watch your guests hug the opposite side of the hallway as this guy reaches 2 1/2 feet into the walkway, trying to grab a victim. Now you've got them set up for a scare from the other side. 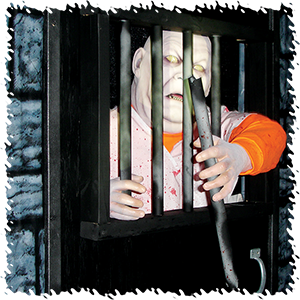 Terrifying in it's own right, this set-up maximizes your next scare. “I think this one's empty," is exactly what you want to hear at this scare. Those “famous last words" will be interrupted by this inmate dropping down from the top of his window to terrify your guests. The asylum's best seller, no one sees it coming. The K9 unit has gone rogue! Watch out as this monstrosity tries to take your leg off! This Scare comes at knee level, when guests least expect it. It does double duty as a set-up when guest warily walk around it. Guests will jump when these hands come lunging from the food tray slot! The low angle creates a scare from an unexpected place. 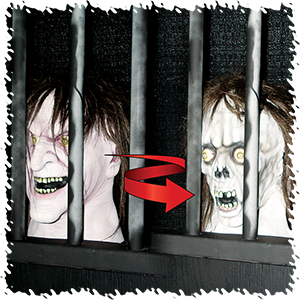 This Set-up moves guests eyes toward the floor setting them up for a scare from above. This guy is a real Jekyll and Hyde! 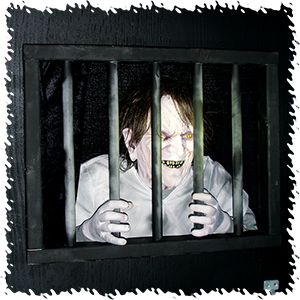 Your guests' first impression of this happy-go-lucky inmate will change very suddenly as an innovative spinning head mechanism reveals the true nature of this horrific fellow. Watch this Scare change before guests eyes!